Despite its questionable launch strategy the Commonwealth Bank’s new “Can” brand positioning may have the ability to stake out a real point of difference that will leave its competitors behind. Australia’s ‘big four’ banks have traditionally been perceived by consumers as a largely undifferentiated group of institutions. A group that has also be seen as being far more focused on exploiting their market power to serve their own interests rather than the interests of their customers. Their ever changing advertising over the years is testimony to their struggle to come up with meaningful and differentiating strategies. This said, according to some industry observers, the big four have adopted more differentiated positions in recent times than they have in the past. The question is if any of them can build on these positions to create real and lasting brand advantage. Or, once the novelty of their new campaigns wear off, will consumers simply see them as being just more marketing ‘puffery’. The answer to this may lie in the authenticity of their brand promises. Trust is seen as key in financial services, yet research has shown most consumers don’t believe it when their banks say “we care about you”. Trust in turn is driven by perceived authenticity. As stated by Keith Yamashita & Sandra Spataro in their book Unstuck: “The most authentic brands are those where there is no gap between the purpose of the company and its actions, no gap between what it aspires to be and how it acts everyday”. Put simply then, the bank that can show it’s really walking the talk should win. Basing a brand promise in reality may sound obvious but it is surprising how often this is forgotten. Sir John Hegarty, one of the world’s most respected admen, has long been a proponent that “truth is the most powerful strategy”. In his words, what “works and sells” is “great products and services with genuine unique selling points (product truths), creatively delivered to attract the attention of consumers”. So which of the big four have are living up to their brand promises with genuine and unique product truths? Westpac – ‘Know’ no different? Westpac’s current slogan is “If you know what, we know how”. Arguably more substantial than its short lived “We’re a bank you can bank on” (an opportunistic response to the consumer angst caused by the GFC), this direction may be grounded in fact but lacks uniqueness. Go to the Westpac website and you’ll see a range of fact sheets and tools demonstrating its knowledge in everything from business banking to personal budgeting. The thing is all its competitors have similar tools; they all “know how”. As such, at least on the basis of its brand promise, Westpac is currently the least differentiated of the big four. (Which may explain – at least in part – why at time of writing Westpac has announced an advertising review with the incumbent agency responsible for the “We know how” positioning not being invited to re-pitch). The ANZ has long had strengths in customer service, consistently winning awards for it. In 2007 it built on this to make the commitment to being “Australia’s most convenient bank”. All well and good. But then in 2009 it decided to ‘upgrade’ this promise to “We live in your world”. According to its press release at the time this was about giving its customers simpler banking in an ever complicated world. About delivering “uncomplicated solutions that are shaped around you” and bringing “banking to your fingertips in more convenient ways you never knew you needed “(my italics). It can be seen that there are two problems with this direction. First it creates an expectation that is very difficult to live up to. Every time the ANZ fails to deliver convenient banking – let alone unexpected convenience as its promise suggests – the chances are its customers are judging it more harshly than they would its competitors. Second it requires ongoing proof. But rather than provide this the ANZ opted after its original launch campaign to simply restate the promise in a follow up campaign using Simon Baker’s The Mentalist persona. As a result many consumers probably share the opinion of The Punch review of the campaign which concluded, in a take-off of Baker’s dialogue, “You’re thinkin that it’s terribly presumptuous of a bank to assume what you’re thinkin”. Making a big promise and living up to it is certainly a formula for brand success. Often a bold promise will focus and galvanise an organisation’s performance. (Think Fedex’s “When it absolutely, positively has to be there overnight”). The ANZ’s promise is rooted in what today’s over-stressed consumer would ideally like to experience in banking, and so has the potential to be highly compelling. But in the absence of real evidence that the ANZ is providing new, surprising levels of convenience in banking, it may just remain an overpromise; and inviting of the consumer cynicism that typically arises from this. NAB – will it have enough to keep ‘giving’? With the stated direction to make “banking better and fairer for everyone” the NAB’s “More give, less take” positioning is the current pace setter in the industry. This has tapped into the zeitgeist surrounding the perceptions of the big four as a self-interested, collusive ‘club’ noted previously. The first proof points for this were its abolishment of overdrawn fees and a range of different fees – like monthly account keeping fees – on transaction accounts. Another important point has been it offering the lowest standard variable home loan rate of the major banks for the past two years; something it has committed to maintaining for 2012. Building on these it then ‘split’ with its competitors on Valentine’s Day 2011 via the much lauded “Break Up” campaign. Though not a proof point in the typical sense, the act of disowning the other big four banks was aimed at creating a ‘truth’ in the minds consumers that the NAB must be fairer by virtue of its very public declaration. (A strategic move that game theorists call – for obvious reasons – a “Burning bridges” commitment). The challenge for the NAB is being able to stay ‘fairer’ than the other banks which, for instance, followed their abolishment of fees fairly quickly. Currently its home loan rate stands at 6.78%, just 0.02% lower than the ANZ’s and Commbank’s rates. So while it has to date – in Hegarty’s terms – “creatively delivered” its “unique selling points” to “attract the attention of customers”, the question is how long it can keep relying on clever communications if its proof points cease to be unique or their level of difference to competitors simply become inconsequential. Commonwealth – can it focus on substance rather than sizzle? To date ad industry commentary has concentrated on the ostensibly broad cultural resonance of the “Can” campaign. (As well as whether its teaser phase was worthwhile, where the unbranded word “Can’t” was advertised heavily in advance of Commbank being revealed as the author of “Can”). This perspective was apparent in the Toni Collette narrated “Ode to Can” launch TVC, a poem condemning negative thinking and praising the power of positive thinking. Interestingly a Herald Sun webpoll asking people whether they liked the spot generated only 42.5% ‘Yes’ responses with the a majority of 57.5% answering ‘No’; an early indicator that middle Australia may not be that receptive to statements of motherhood positivity (or at least the implicit condescension of the ad’s Dr Suess-like tonality). 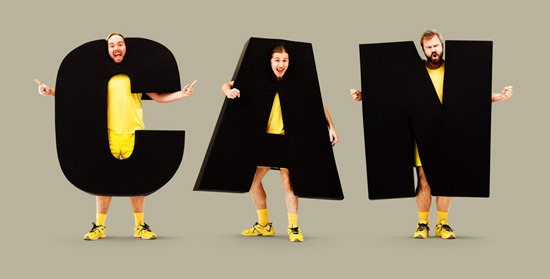 The campaign focus on ‘can do’ sentiments was reinforced in the bank’s Olympic sponsorship advertising, where three personified “CAN” letters side with various aspiring gold medallists to cast down doubts (represented by a personified “T”) about whether they can win their events. Unfortunately most of the athletes featured didn’t achieve their goals, most famously swimmer James Magnussen, the hot favourite for the 100 metres freestyle. As consumer psychologist Adam Ferrier remarked, “The CBA has launched a campaign reinforcing can but the problem is Magnussen has done the opposite in reinforcing can’t”. This also highlights another danger of big, open-ended brand promises. If a brand doesn’t set boundaries for consumer expectations each time people see that it isn’t delivering on its promise they judge it more harshly for the perceived short coming than would have been the case otherwise. Commbank (like the ANZ) may find that its customer satisfaction ratings decline if their performance fails to live up to the higher expectations they’re setting. This also creates fodder for social media. As one initial post to the campaign launch opined, “Can’t pass on the interest rate cut”. Given what the campaign has concentrated on to date, people could be forgiven for thinking that ‘Can’ is all about a positive ideal. While Commbank’s communication of this ideal has been problematic, on paper the strategic intent is reasonable. After all, it is a growing trend for brands to position themselves as a flag bearer for a belief (see the post The New Alternatives for Brand Strategy: Go Big or Go Small). As a second tier to the campaign Commbank has released several TVCs featuring its superior systems. For instance, the Kaching app that allows its customers to – amongst other things – transfer money to their friends using their mobile, email or Facebook contacts. And its award winning Property Guide app that puts information on almost every house in Australia at the fingertips of prospective home buyers. Even prior to the ‘Can’ direction Commbank was already talking up its differentiated capabilities, such as the claim to its business customers that: “Unlike some other banks Commonwealth Bank provides same day settlement on the credit and EFTPOS sales your business makes, every single day – 7 days a week, 365 days a year”. Regardless of the current weighting of the campaign towards the communication of optimistic values, the foundations of the brand positioning obviously lie in Commbank’s “product truths”. It is these truths that give it the right to tell the “Can” story. It may be that going forward Commbank’s intention is to evenly balance the emotional side of the story – the values based ‘sizzle’ which to date has been its focus – with rational communications of its superior services. From a strategic communications planning perspective this has a default appeal. After all, it is widely recognised that strong brands are built on a combination of emotion and reason, and this allows for neat layers of communication each with a distinct role. But arguably if Commbank does indeed have a clear set of product advantages this approach would dilute the communication of these. Given that banking is a category that most consumers still have problems with, not to mention their general cynicism towards the big four, it should forget the ‘sizzle’ (or at least de-emphasise it) and now focus its efforts on pressing home its real and tangible differences. Taking the lead from the NAB’s success, Commbank should concentrate on showing what it actually does and can do for customers. In doing this it doesn’t need to neglect building emotion into the brand. It ‘simply’ needs to find a way to communicate its product truths with emotion. Something again that the NAB has managed, as indicated by a Forethought Research study that found that the NAB’s advertising “created positive emotions like happiness and surprise” amongst viewers. As originally stated, the bank that can show it’s really walking the talk should win. Commbank may just have the product firepower to do this. The question is whether it “Can” tell its story well.